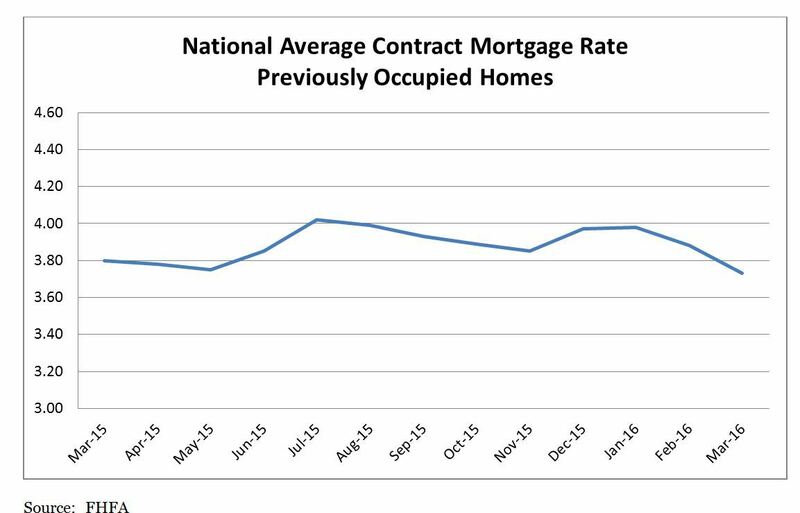 The national average contract mortgage rate for previously occupied homes by combined lenders decreased 15 basis points from February 2016 to March 2016. The average interest rate on all mortgage loans was 3.76 percent, down from 3.89 in February. The average loan amount was $325,000 in March, up $8,300 from $316,700 in February. National vacancy rates in the first quarter 2016 were 7.0 percent for rental housing and 1.7 percent for homeowner housing. The rental vacancy rate of 7.0 percent was 0.1 percentage point lower than the rate in the first quarter 2015 and virtually unchanged from the rate in the fourth quarter 2015. The homeowner vacancy rate of 1.7 percent was 0.2 percentage points lower than the rate in the first quarter 2015 and 0.2 percentage points lower than the rate in the fourth quarter 2015. Mortgage applications decreased 4.1 percent week-over-week for the week ending April 22, 2016. The refinance share of mortgage activity decreased to 54.4 percent of total applications from 55.4 percent the previous week. The average contract interest rate for 30-year fixed-rate mortgages with conforming loan balances ($417,000 or less) increased to 3.85 percent from 3.83 percent, with points increasing to 0.35 from 0.32 (including the origination fee) for 80 percent loan-to-value ratio (LTV) loans.